What’s YOUR Face Down Moment? Do YOU have a story about a point in time when everything changed? When you looked at yourself in the mirror and realized that you could not continue on the path you were on? Do YOU have a story about a point in time when everything changed? When you looked at yourself in the mirror and realized that you could not continue on the path you were on? If YOU haven’t had that moment just yet…it is the wish of Arianna Huffington that through story telling we can help others avoid it or minimize it. Hopefully the current generation and subsequent generations will be better than us at identifying the warning signs and will proactively live a life of wellness to avoid massive burnout or even collapse. Practicing self-care is a big part of the quest to redefine what success truly means. I had the opportunity to hear Arianna speak at a “Women in Technology Event” at #HPReInvent17 last week and she challenged the audience to share their “pivotal moment”…what they learned and how they have grown from the experience. Mine happened in 1999 and it forever changed the way I look my personal and professional life. Shortly after my second daughter, Emily was born (December 14, 1999) on a particularly snowy Canadian winter day, a blood vessel burst at the base of my brain and I was in ICU for several weeks. The blood vessel bursting happened when I was home alone several days before Christmas. I knew something was terribly wrong but I absolutely refused to admit it. I remember lying on the floor of the bathroom after feeling like I was struck by a bolt of lightning. I somehow managed to crawl from the bathroom to the bedroom and pulled myself up onto the bed. I had the worst headache of my life and my neck was stiff. Even though I was scared…I kept telling myself it was okay and that I was just over reacting. I called my husband and then my Doctor. She thought I was just having a post-partum episode and prescribed some pain medication. Anyone who knew me at the time would willingly admit that I was a self-professed work-a-holic…very strong willed…independent and the last person to ask for help. Unlike other people…I could handle anything and do it all. Resting and stopping was for the weak…I was invincible. 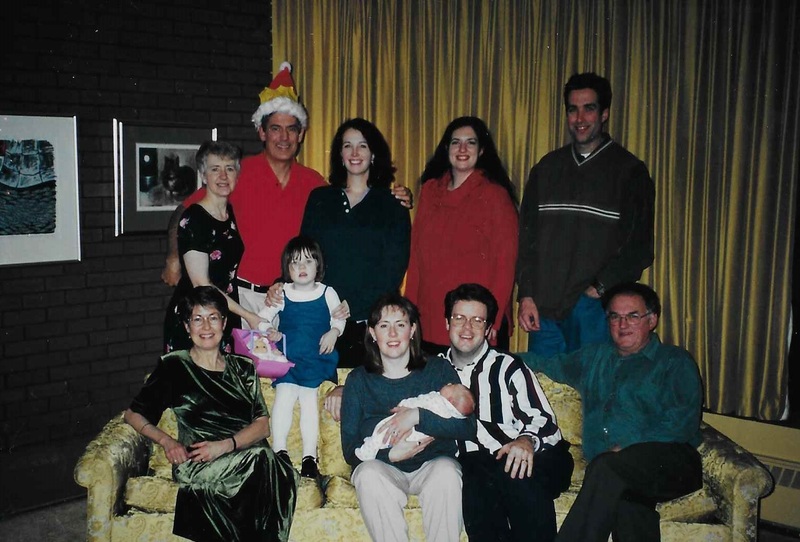 Not only did I ignore what was happening until Christmas night (11 days later), but I continued to breast feed every four hours…finished the Christmas shopping and I lugged Emily over snow banks in the car seat as we made our way to various holiday parties and events. If I pushed through the pain it would eventually get better…right??!! When they admitted me on Dec 25th after all the presents had been opened and the kids had gone to bed, my spine was full of blood and so was most of the area around my brain. They told my Mother that they doubted I would live through the night. The whole time it was happening – I knew it would be OK but those around me were not as convinced. In that moment I was forced to stop and accept that I needed help. The irony of the whole thing was at the time I was the Director of Planning & Standards for the QEII Hospital. That meant I was in charge of Y2K Disaster Recovery planning for the IT Department of the very hospital I was staying in. I was grateful at the time that Y2K was a non-event and that we planned well in case anything went wrong! I also have to admit that was the loneliest New Year’s I have ever experienced and I knew that I never wanted to feel that way again. Even to this day….what is interesting to me is how much I learned from that experience and how it significantly impacted how I look at life. I know it sounds wrong to say, but I wish everyone could have a near death moment to realize what is important and how to appreciate each and every day. Here is what I learned…. The people that truly love you will have the courage to come and tell you…and it will humble you to tears. Those are the people that you need to tell every day that you love them and don’t ever take it for granted that they know it. Change takes time and you have to forgive yourself if you slip back into old habits. You will have times when you need to take inventory, reflect and reset – it’s never one and done. You are constantly a work in progress. Here are the changes I made…. I found happiness…inner calmness….contentment and success in slowing down and being vulnerable. Not sure why it took such a dramatic face down moment to learn all of this. As you live your life you have to be mindful that you can’t choose how you may be remembered so you have to live intentionally. Live each day as if it is all you have… it may be all you have. Lay your head on the pillow each night without any regrets and nothing left unsaid. What’s YOUR Pivotal story or Face Down Moment? If you haven’t had it yet…can you reflect on your current lifestyle choices and identify two or three things that you can do to change TODAY that would put you on a path to living more intentionally…happily and healthily? How do you want to be remembered? Worked long hours? Had a big Title? Had the Most Toys? Cared for others? Loved your family? Made a difference? All of the above? What things do you do consistently in your personal and professional life that demonstrates the things you would like to be remembered for? What do you think of the lessons learned? Are there any that are familiar to YOUR story? Why does it take a pivotal moment for us to realize what is truly important? How can we give those that haven’t had a pivotal moment the same sense of urgency and deep caring to make the changes that need to be made both personally and professionally before they collapse or burnout? Do we have to let others just learn it on their own and simply be there for them to support them through it or are there steps we can take to help? Thanks for reading and remember…..YOU make a difference! Be sure to continue the conversation by liking, commenting or sharing this post. You can also follow me on twitter @marciedwhite. Marcie is currently the Hewlett Packard Enterprises, Americas Relationship Director for HP Financial Services (HPFS). Every day, Marcie strives to bring passion. purpose, high energy and a "get 'er done" attitude to all that she does. A life long learner with 25+ years experience in various industry verticals related to Information Technology and Consulting. Marcie applies her genuine desire to get to know others, her innovative marketing approaches as well as her technical, analytical and engineering qualifications to all aspects of her career. Marcie holds a Bachelor of Science degree and certificate of Applied Science from Acadia University as well as a Bachelor of Industrial Engineering degree from Dalhousie University in Nova Scotia, Canada. She currently lives in Phoenix, Arizona with her husband Jonathan and two daughters Katie (22) and Emily (18).